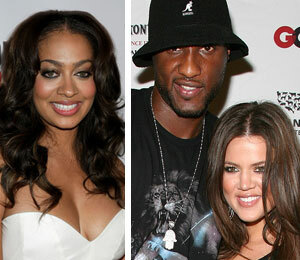 MTV VJ LaLa Vasquez says Khloe Kardashian and Lamar Odom are "the cutest couple" and they're "very happy"! Vasquez is among the celebs invited to the couple's Sunday nuptials in L.A.
"I'm always excited when I see friends happy and in love," she tells UsMagazine.com. "Who wouldn't want that for their friends?" Vasquez says Kardashian, 25, and Odom, 29 both have "cool personalities." LaLa says she isn't judging them for their quickie wedding. "You can't put a time on love. I wish them the best, and I'm sure they are going to have a great, happy, long marriage." To help the happy couple along, reports say that OK! mag will shell out $300,000 for the wedding pix.